Deric's MindBlog: Response of large scale brain networks to acute stress. Response of large scale brain networks to acute stress. I pass on this interesting summary and graphic by Hermans et al. 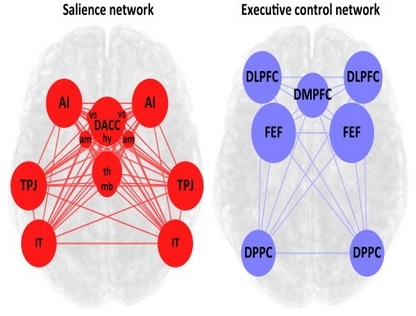 Exposure to acute stress prompts a reallocation of resources to a salience network, promoting fear and vigilance, at the cost of an executive control network. After stress subsides, resource allocation to these two networks reverses, which normalizes emotional reactivity and enhances higher-order cognitive processes important for long-term survival. Schematic anatomical overview of salience and executive control networks. The sphere sizes illustrate the relative sizes of the clusters that co-activate with the respective networks. Our model proposes that these two neurocognitive systems are regulated in a time-dependent and reciprocal fashion by stress-related neuromodulators. Adapted from. Abbreviations: AI, anterior insula; am, amygdala; DACC, dorsal anterior cingulate cortex; DLPFC, dorsolateral prefrontal cortex; DMPFC, dorsomedial prefrontal cortex; DPPC, dorsal posterior parietal cortex; FEF, frontal eye fields (precentral/superior frontal sulci); hy, hypothalamus; IT, inferotemporal cortex; mb, midbrain; Th, thalamus; TPJ, temporoparietal junction; vs, ventral striatum.